That’s something I’ve noticed too. It never ceases to amaze me how many people who live in or move to our area have remarkable gifts and talents: for painting, wood-carving, bookbinding, metalworking, gardening, music, photography, long-distance running, historical research, storytelling, cooking, graphic design, homebuilding, landscaping, chicken-raising, baking, kids’ programs, flower arranging, esthetics, pet grooming, maple-syrup-making, athletics, metal detecting, building restoration, and on and on and on. Today I want to showcase the work of one of those people. And in doing so, I’m happy to say, I get to tell you a bit more about what seems to have become the unofficial bird of Meanwhile, at the Manse: the American Bittern. This was the best I could do to illustrate what I was talking about the first time I wrote about spotting a bittern in Queensborough – a photo of a page from our Audubon guide to birds. It makes you appreciate the quality of Lloyd Holmes’s photo that much more! Longtime readers may recall that I first wrote about this bird five years ago, telling a story about spotting a very striking large, long-necked bird standing near a marsh area on the side of Queensborough Road. (That post, if you’re interested, is here.) At the time neither Raymond nor I had any idea what bird it was we’d seen, but we turned to our Audubon Guide to Birds of Eastern North America and soon learned that it was an American Bittern. “When an observer is nearby, it will often stretch its neck up, point its bill skyward,” the guide told us – and that was exactly the odd position we’d seen it in. Then about a year after that first sighting, we came across a baby bittern crossing a road as we were driving to Queensborough from Montreal, where we still owned a home. You can read that post, and see my terrible photos, here. A final connection with the bittern is that until this year, one of them has inhabited a marshy area that’s more or less right in the centre of Queensborough. We’ve never seen that bird, but on many evenings we’ve heard it making its distinctive kitchen-sink-glug-type call. As I write this, however, I realize that we didn’t hear our bittern this past spring, and that makes me sad. I hope nothing has happened to him/her. But on to the connection between the American Bittern and talented local people. A little while ago, I received an email from Lloyd Holmes, who grew up in Cooper, the hamlet just north of Queensborough, and who now lives in the not-far-away community of Marmora. Lloyd’s been to quite a few Queensborough events recently – and believe me, there have been a lot of Queensborough events recently – and I featured some of his stunning photos of our annual kayaking event here. The historic Thompson mill in Queensborough that Lloyd Holmes refers to in his reminiscence. In the foreground you can see an old millwheel. Lloyd: I hear you, loud and clear. Now that, people, is what a bittern looks like. Light-years better than my photo of a photo from the Audubon guide, which itself was far inferior to Lloyd’s shot. Let’s just say that I expect I am now not the only one eager to see those photos! As Lloyd says: “Some people like to see and read about our neighbours in the forest.” Count me in! There are also more photos here of the kayakers in Queensborough. I think you will agree with me that Lloyd Holmes has a prime spot on the long list of Queensborough-area people who are cool, interesting – and extraordinarily talented. They say our school should be closed. We can push back. Madoc Township Public School, opened in 1961 to serve students from the rural area that includes Queensborough. Will this be its final year of operation? The place where I began my school days, where I learned cursive writing and the times tables and long division and the parts of a flower and the life cycle of a monarch butterfly and how to say “Je m’appelle Katherine” and how to play Red Rover – that school is threatened with being closed at the end of the current school year. And I am very sad about that. Well, sad – and mad. And mad not necessarily for the reasons you might suspect. Me in front of my old school. As time went on, children from one-room schools a little further afield were also moved to Madoc Township Public School. That was the case in 1966 for kids from Queensborough; our hamlet’s one-room school, built in 1901 (and now the Queensborough Community Centre) was closed that summer, and so in September I, along with all the other kids from the village, climbed aboard a big yellow bus to attend the new school a few miles west of us. I was just starting Grade 1 – we didn’t yet have kindergarten – so Madoc Township Public School was my very first educational experience. The staff of Madoc Township Public School, c. 1966-67: back row, from left, Anna Carman, Sadie Miller, Vera Burnside, Monica Tobin and Evelyn Boyle; front row, from left: Irene Reid, principal Florence McCoy and Gayle Ketcheson. As I’ve said before: best teachers ever. So you’re probably thinking I’m mad about the threatened closing of Madoc Township Public School because it’s my old school. I expect there’s a bit of that running around in my head and heart, and I don’t know how there couldn’t be. But what I’m really mad about is this being yet another undermining of our rural way of life here in our historic North of 7 part of the world. Secondary School, creating a Grade 7-12 model, for September 2017. Now, I also attended Madoc Public School; that’s where students from Madoc Township P.S. went for grades 7 and 8 when I was a kid here, and that’s still what happens now, more than four decades later. It’s a happy little school, like Madoc Township, and I bear it no malice as I voice my opposition to our school being closed and its students sent there. Oh my goodness, what fun we used to have on “Field Day” at Madoc Township Public School, with those wide-open fields for races, high jumping, long jumping and so on. And we played ball in our own ball diamond too! The soccer field at Madoc Township Public School. And that’s not all of it! There is a lot of space for kids to play at that school. Now, don’t you think that at a time when kids are getting very little exercise and having a hard time focusing their brains because of the constant distraction of the phones and screens they spend their lives in front of (much like their parents and, let’s face it, all of us), a school with magnificent wide open spaces for good old-fashioned play is – well, a good thing? Plaques paying tribute to the founders of Madoc Township Public School – including, of course, its founding principal, Florence McCoy. So I’m mad about this great school, in its unparalleled natural setting, possibly being closed. And I’m mad about the loss of a rural institution. God knows we here in rural Ontario have enough to contend with – high hydro rates; businesses that struggle to survive in the shadow of people’s incomprehensible (to me, anyway) determination to drive 35 miles to Walmart rather then buying local; less-than-great access to health services – without losing our community school too. I’ve mentioned that once upon a time I was an education reporter who covered school boards for my local newspaper. One thing I learned from that experience is that nothing gets people more riled up than the threat of their kids’ school being closed. Another, more important, thing that I learned is that if you fight hard enough, you can sometimes win. The school board is directed by paid bureaucrats who make recommendations (like closing Madoc Township Public School); but the actual decisions are made by the trustees elected by you and me, and those trustees’ job is to represent the wishes and needs of their constituents. I believe you should let them know what you think. If you can manage it, go to the meetings where this important decision will be discussed; there is great power in numbers, and in representation. The first such meeting (which crops up rather suspiciously soon, in my view, after the news about the planned closures emerged late this past Friday) is supposed to take place this very day (Monday, Nov. 21 – though the current weather situation might have an impact) at Prince Edward Collegiate Institute in Picton at 3:30 p.m., when the aforementioned school enrolment/school capacity committee meets. That will be followed later today by a full meeting of the board, also at PECI in Picton, at 7 p.m.
At those meetings and the others that will follow, make your case for why Madoc Township Public School is a vital part of our community. Elect spokespeople. Organize. Don’t be intimidated by anyone who might suggest they know more about our school, or the needs of our community, than we do. I think we should stand up for our school, and for the sustainability of our rural way of life. It’s important. Let’s not give up without a fight. A while back, my Madoc Township friend Grant Ketcheson sent me a couple of photos from June 1945. They feature a happy occasion: a wedding that took place right here at the Manse in Queensborough. Now, before I tell you the rest of the story, let me explain that back in those days, it was fairly common for couples to be married at the minister’s home rather than in a church; I wrote about another such wedding, which took place in October 1939, here. And in this post I told you the story of probably the most famous wedding in Queensborough’s history, that of village storekeeper and unofficial mayor Roberta (Bobbie) Sager and her longtime beau, Allan Ramsay, in the mid-1970s. The wedding was top-secret, and man was the rest of Queensborough surprised when they learned about it the next day. It happened right here in the Manse living room where I’m typing these words; and it is one of the great boasts of my life that I can say I was present on that historic occasion when my dad, The Rev. Wendell Sedgwick, declared Bobbie and Allan man and wife. But back to the June 1945 wedding of Joan Murray and Roscoe Keene – the happy couple you can see having confetti tossed at them in the photo at the top of this post, and eventually Grant’s aunt and uncle. Grant sent me that photo, as well as the one you’ll see just below, because he knew I am interested in a) local history and b) photos showing the Manse (the house I grew up in, and to which I returned a few years back) in earlier times. To which I say publicly (as I told him privately at the time): Thank you so much, Grant! I’ll dispense fairly quickly with the house details that Raymond and I spotted with interest in examining these two photos. And then I’ll turn to my main focus for this post: war and remembrance. Because, as we all know, this coming Friday is Remembrance Day. My brothers Ken (left) and John, sometime in the mid to late 1960s, playing in the shade of the old maple tree that you can see behind the newlyweds in the photo atop this post. The tree was, most unfortunately, cut down some years before Raymond and I bought the Manse; as I told you here, we have honoured its memory and striven to bring shade back to our front lawn by planting a new maple in its place. We were also interested to see that in 1945 the rounded door to nowhere off a second-storey room (my father’s study during my childhood here), as well as the “official” front door (which no one ever used) that shows up in both of Grant’s photos, were painted quite a dark colour as opposed to white, which they are today. There are also the old windows, two panes over two, that I hope to replicate as part of our renovation/restoration project. And finally in that first photo, I am struck by how well one can see, in the top left corner, the house far to the rear of the Manse on the property next door. Trees that have grown up since then would make that house invisible in a photo taken from the same angle today. But we didn’t think about a railing. So that old photo is food for thought, and possible future action. However: architectural details are surely not what you will find most interesting about these photos. What makes them compelling is the story behind them, which I will tell with Grant’s help. “My uncle’s wedding, June 9, 1945,” he begins. “He married a war widow, Joan Lomax-Murray. Between 1869 and the late 1930s, over 100,000 juvenile migrants were sent to Canada from the British Isles during the child emigration movement. Motivated by social and economic forces, churches and philanthropic organizations sent orphaned, abandoned and pauper children to Canada. Many believed that these children would have a better chance for a healthy, moral life in rural Canada, where families welcomed them as a source of cheap farm labour and domestic help. Thomas John Barnardo began the movement, first opening a school in London for these kids who came from dreadful circumstances, and later arranging for them to travel to Canada. Doubtless his intentions were good, but many of these children, torn from home and everything they knew, were placed in unsympathetic families who used them as a source of free labour. Here is a story from the Winnipeg Free Press that gives a sense of what some of them endured. That said, there can be no doubt that other “Barnardo boys” found good and welcoming homes in Canada. It seems Alec Murray was one of these; the fact that, after his death, his English widow went to the trouble to come and visit his Canadian “family” tells you that he must have spoken fondly of that family and his experience in this country. But I’m getting ahead of myself. Let’s let Grant continue to tell the story. As he told me in a phone conversation this evening, Alec Murray – known locally, like other Barnardo boys, as “an English lad” – became very much a part of the Madoc and Madoc Township community, and particularly the community around the tiny Madoc Township community of Hazzards Corners. He worked on farms in the area, and was very active in the historic landmark church that marks those corners. “His widow came to Canada to visit with Alec’s Canadian family, and [eventually] married my mother’s brother, Roscoe Keene. It is a long and touching love story that I hope to put on paper someday. “My mother [who, readers, you will recall from the second photo in this post was there at the wedding at the Manse] always said that there should have been a stone in the cemetery for Alec Murray as he had become a ‘Hazzards boy,’ always active in the church. When my Aunt Joan died, Uncle Roscoe had the stone inscribed with their names [his and Joan’s] and “Farewell My English Rose” added after Aunt Joan’s name. Perhaps especially so because the inscription was done at the behest of Roscoe Keene, the now-nonagenarian second husband and widower of Joan, who died in 1999. The same Roscoe Keene who is the dashing young man you see in those photos taken on his wedding day – June 9, 1945 – here at our Manse in Queensborough, and who now lives near Kingston, Ont., enjoying a well-deserved retirement after many years as a marine engineer. What a class act Mr. Keene is, to have had an inscription honouring Alec Murray added to the tombstone for himself and his late wife in the historic cemetery at Hazzards Corners Church. And indeed it does. A story of love, loss, sacrifice, strength and reslience. A sunbeam shines down through the fluffy clouds on the ever-growing tent city at the site of the Hastings County Plowing Match and Farm Show at Cornervue Farms on Queensborough Road. Remember how a few months ago I told you that the agricultural event of the year was coming to Queensborough? And explained that the agricultural event in question was the Hastings County Plowing Match and Farm Show? Well, guess what, people? The Plowing Match is upon us! And here in Queensborough and environs, we are braced for a huge influx of people and lots of excitement. Why, it’s almost certainly the biggest thing to hit our corner of the world since the Rock Acres Peace Festival way back in 1971! The Hastings County Plowing Match in its current incarnation has been going on since 1989 – although similar events were held well before that, as you can tell from the photo at right, a picture of a picture that appeared in a Plowing Match special edition published by the folks behind one of our local weekly papers, the Central Hastings/Trent Hills News. It shows the event’s publicity chairman, Jim Haggerty, with a poster advertising a plowing match in central Hastings County back in 1966. As you can see, there’s a lot more of Hastings County north of Highway 7 – the yellow line running east-west through Marmora and Madoc – than there is south of it. Not too much of that land is good for farming, however – with some happy exceptions. While I tend to think of 1989 as yesterday, it was in fact a while back – 27 years, to be exact. And in all that time, people, the Plowing Match has never until now been held North of 7! (That’s Highway 7, for those uninitiated with the phrase, which I explain in detail here.) This might seem odd, given that there’s a lot more square miles of Hastings County north of 7 than there are south of it. But Highway 7 is the east-west dividing line between fertile farmland and rolling hills and fields (to the south) and the thin and rocky soil atop the Canadian Shield (to the north). North of 7 country is where pioneers’ dreams were dashed, when they tried and utterly failed to establish farms on soil that just wasn’t good enough. The whole story of the Old Hastings Road a bit north of Queensborough is about that. However – and this is very important: that doesn’t mean there aren’t areas of good soil, and very successful farms, north of 7. The McKinnon operation just west of Queensborough is one excellent example. Angus McKinnon – my contemporary and former schoolmate at Madoc Township Public School and Centre Hastings Secondary School, back in the years when I was growing up in Queensborough – now operates the farm with his father, Don, a very active nonagenarian. As Angus said in an interview published in that Plowing Match publication I referred to earlier, Don “has been here all his life, and his father and his father.” The McKinnon family settled the farm back in the 19th century, and has operated it successfully in all the generations since. We’re all so happy for the McKinnons’ operation to be in the agricultural spotlight in this way. And so excited about the week ahead! So there’s plowing, of course: competitions in many different classes in which, to quote the event’s website, participants “are judged or scored in five different areas, including the opening split, the crown and the finish. And covering any green matter is mandatory in all classes, whether it is plowing in grain stubble or sod.” (I confess I really do not know what any of this means, but I hope that after watching some live plowing this week I will.) The classes include tractors, horses, antique tractors, walking plows, young people, and Queen of the Furrow (more on that shortly) – as well as one for local politicians, and even one for the media. (Do reporters and heavy farm equipment mix? I guess we’ll find out!) And all of that’s a big deal. A great old Allis-Chalmers, one of the many antique tractors that will be on display at the show. I leafed through the ads in that Plowing Match publication to get a sense of other equipment and services that would be on display, and here’s just some of what I found: milking systems for tie stall, parlour and robotics (Greek to me, but dairy farmers will understand); generators; custom manure spreading; chainsaws; fuels; seeds; farm insurance; trailers; wood stoves; bush hogs; roofing; farm sheds; feed suppliers – and on and on and on. Freddy Vette, a hugely popular musician and DJ on good old CJBQ radio out of Belleville, should be a big draw. Fashion shows featuring ordinary humans from the local area as models are always fun. The Hidden Goldmine Bakery in Madoc is insanely great (as I’ve written before), and it will be interesting to hear from its proprietors, Cheryl and Brad Freeman. And I am delighted that Queensborough’s own Elaine Kapusta has been invited to speak about “Historic Queensboro” (love the vintage spelling)! Queensborough caps, mugs and cutting boards will be for sale at the Queensborough Community Centre tent. Hey, speaking of Elaine and “Historic Queensboro” – the organization that Elaine will be representing, and that Raymond and I are also volunteers with, will have a tent at the farm show. Please stop by the Queensborough Community Centre tent to say hello, learn more about Queensborough, and maybe buy one of our nifty items for sale: Queensborough walking/driving-tour booklets, and caps, mugs and locally made cutting boards all featuring the Queensborough logo. What a great memento of the farm show – and in buying them you’ll be contributing to the work that the QCC does in promoting our little hamlet, preserving its heritage, and providing community programs and events. As is always the case, many hands made light work, and there was a lot of laughter along the way. We’re going to be working awfully hard on Wednesday and Thursday to feed those long lineups of hungry farm-show visitors, but we know the experience will also be a whole of fun. So listen: your mission for this week is to come visit the Plowing Match! Enjoy the plowing, the equipment displays, the special events, and the food. (Ours will be the tent at the northwest corner of the site – and did I mention there’ll be homemade pie?) Enjoy the company of lots of good farm folk and their urban neighbours out for a day in the country. And most of all, enjoy the beautiful surroundings of the McKinnon Farm and Queensborough – which is, as we say around here, a little bit of heaven north of 7. Hazzards Corners Church on a blazing-hot day this past week with the new shingles having been installed on the west side of its roof (and roofers working away at the east side, which you can’t see in my photo), and the louvers on the steeple being painted. How wonderful to see this major project being done, just in time for the annual summer service there! Every year around this time I like to alert – and invite – you readers to a happy event that takes place just up the road from Queensborough: the annual summer service at historic Hazzards Corners Church. This year is no different – or … wait. Actually, it is different. Because this post (unlike the ones I’ve done here and here and here, the last of which rather incidentally features a pretty great recording of the Carter Family singing Church in the Wildwood) is not just to inform you of the event this coming Sunday (Aug. 21, 2016). It’s more to pay tribute to a group of community volunteers who are doing an outstanding job of preserving that lovely little country church so that it may be enjoyed by you and me at events like the summer service. The authors provide all kinds of interesting information about the founding of Hazzards Church, and stories about church life through the years. Re-reading it this evening, I was struck by how many of the names of the church founders way back in the 19th century are still very much associated with the local area today – names like Ketcheson, Harris, Burnside, Moorcroft, Broad, Blair, Love, Kincaid and McCoy. A sketch of Hazzards Church by the late Vera Burnside (once my Sunday School teacher, and a truly great woman – and you’ll note her family name, which harks back to the church’s founders) showing the old drive shed for the horses and buggies that was still beside the church in my youth. If you’re lucky, you’ll be able to buy note cards featuring this drawing at Sunday’s service. And I loved some of the tidbits about the church building. Like: that the division down the middle of the long pews in the centre aisle was to separate the men and the women (the authors speculate that this may have been a Quaker influence carried over to the Methodists). The interior of Hazzards Church, showing the old pews (not terribly comfortable, I can tell you from childhood experience) and many original finishes. And that the original pews (which are still there) show “the mark of the adze used in smoothing the wood” when they were built. And that “the pulpit, plain and unadorned, has had the lectern raised to accommodate taller ministers in more recent years” – my dad was quite tall, as was the minister who immediately preceded him, The Rev. George Ambury. And fields and hills, in morning hours of prayer. And that’s a good segue into what I want to tell you about. Hazzards Corners Church was closed as a United Church of Canada place of worship in 1967. The decision was made by the central church, not locally; it came at a time when many small country churches were being closed and consolidated as the number of Canadians attending church regularly began to show a major decline. It was a very painful thing for people to see the church that they had attended all their lives, that their parents and grandparents had attended all their lives, shut down. Those were sad times in many country churches and pastoral charges. Are our communities better places for historic former churches being torn down, or neglected until they’re run down? I think not. At last year’s summer service, Grant Ketcheson, whose family back in the day was among the founders of Hazzards Church and whose family today continues to work very hard to preserve it, told the gathering before the offering was taken up that the church was going to need some major work very soon. Grant Ketcheson, a tireless volunteer at Hazzards Corners Church, talks about the building’s history to an audience of people on a bus tour organized by the Hastings County Historical Society this past June. Grant has a winning and humorous way with words, and in the nicest possible way he was telling us to dig deep into our pockets if we want to continue to enjoy events like the summer service and the Christmas service, and to see this landmark building maintained. And I’m sure many, probably most, of the people in those hand-hewn pews did dig deep. But a new roof and exterior painting of an old building are expensive propositions. And so over the past year, the Hazzards Church volunteers did a thing that many community groups would like to do but that is hard to do well and successfully: they applied for a grant. And they got it! From the Belleville-based John M. and Bernice Parrott Foundation, a fund that has helped so many good causes in Hastings and Prince Edward counties (and probably beyond) over the years. “Our prayers have been answered!” the group reported on the Hazzard’s Church Facebook page back in April of this year. And now the work is taking place. This past week, in heat and humidity that almost defied description – sweltering, to put it mildly – a crew was busy replacing the worn-out roof tiles with new ones that will last a very long time. When I stopped by to take some photos of the work a week ago, the louvers on the steeple were also being repainted; and I understand that the rest of the building is to be painted this coming week. Very exciting! It is a wonderful thing to see this small group of committed people keeping alive the stories, the history, and of course the actual structure of Hazzards Corners Church for all of us, and for those who come after us, to appreciate and enjoy. And good for them for moving into the social-media era and keeping us informed of what’s going on (even including photos of the very cute fox who’s taken up residence under the church) via Facebook. Smart move. As you can imagine, at Hazzards events there always are a lot of photo ops outside that outhouse! At the risk of being a little over-churchy for non-churchy readers, I thought I’d start drawing this post to a close with the full text of Violet Alleyn Storey’s A Country Church. I think its words are rather perfect in the context of this particular country church at Hazzards Corners. Here it is, and if it’s too much for you, just skip on to the end. A boyhood cottage intimate with sun. And offer Him simplicity and song. And Christ grew up in rural Galilee. At this past year’s Christmas service, Hazzards Church was packed. Every pew spot was filled, as was every chair that could be rounded up and placed in the aisles. A whole bunch of people stood against the back wall through the whole service, just to be part of that meaningful event in that lovely old place. What does that tell you about this coming Sunday? This: come early if you want to get a seat! And hey – if Grant tells you to dig deep, please do. Let’s keep this good thing going. My new Queensborough friends Sherry (left) and Gail work together to get a big old snapping turtle safely across Queensborough Road at Hazzards Corners. The tiny corner of the world known as Hazzards Corners – it’s so small you can’t even call it a hamlet – has loomed large in my Queensborough life these past few days. In a good way! I thought I’d tell you about that in this week’s instalment of Meanwhile, at the Manse. Nothing earth-shaking; just some delightful little local incidents that all took place there. The turtle I saw Thursday was big snapper of a certain age. How do I know? The moss on her back! It takes time to grow moss on your back. Here she is, before she started across the road. What a beauty! The spot where Mrs. Mossy Turtle had just laid her eggs on the south side of Queensborough Road at Hazzards Corners. I pulled over because I figured if she was about to make the crossing, she’d appreciate someone keeping traffic from interfering with her progress. Or, much worse, hitting her and injuring or killing her. And I waited for her to start. I didn’t wait long. Two things happened: one, the turtle started to cross; and two, another car pulled over. And almost immediately, another. And there were Sherry and Gail, two women from Queensborough whom I’d never met before but who both were a) deeply caring about turtles’ well-being and b) experienced in helping them. As the turtle began to unhelpfully head down the centre of the road rather than across it, we three turtle-helpers quickly conferred and decided we could make good use of the shovel I always carry in the trunk of my car for exactly this purpose. So the shovel came out, and Sherry and Gail compared notes on their experiences with using one to get a big snapper across the road. Gail was inclined to try to get the turtle on the shovel and carry it, while Sherry advocated using the shovel to block Mrs. Turtle’s sideways vision to try to keep her eyes and motion aimed for the opposite site of the road. As Mrs. Mossy slowly – very slowly – made her progress, we tried both approaches, and what ended up working was a bit of a combination of gentle pushes with the shovel and using it as the aforementioned peripheral sightline block. Gail directs traffic with one hand and wields my shovel in the other, while Sherry tries out a technique recommended by one of the drivers who stopped to offer advice: holding out a stick that Mrs. Turtle might bite and hold on to, so that we could carry her across the road that way. (The stick didn’t work all that well, but maybe we need more practice.) But we got her across! I was delighted to make the acquaintance of Sherry and Gail and to hear their turtle-helping stories; and I was also delighted by all the drivers who stopped and offered help and advice, or just supportively watched what we three were trying to do. You wouldn’t – or at least I couldn’t – believe how many vehicles pass through the intersection of Queensborough and Cooper roads at Hazzards Corners at 9 a.m.ish on a weekday morning! They all slowed down or stopped, and really it was quite the community gathering – all in aid of Mrs. Mossyback Turtle and her survival. We got her across the road, and we all went on our way. And if that isn’t a good start to a workday, I don’t know what is. As usual, my photo doesn’t do justice to the beauty of the scene – I am the first to say I am a pretty hopeless photographer – but I hope you can tell that it was a lovely sight. Now here’s my question: what are those white-blossomed trees? Readers, please enlighten me. And hey: if you feel you need to make a field trip to Hazzards Corners to do some first-hand research in the interest of coming up with the correct answer, I heartily urge you to do so. Admire historic Hazzards Church while you’re there, and poke around its beautiful old well-kept cemetery. And hey, if you happen to spot a turtle trying to cross the road – please stop and help her. I am absolutely sure you’ll soon have reinforcements, and will make new friends. All in an excellent cause! Today I want to tell you about a family-history project that has an extremely close connection to the Queensborough area, and that I consider not only an example but an inspiration. It is the work of Keith Kincaid, now of of Toronto, though he grew up in Aurora, Ont., and before that the area of Unionville, Ont. “Hold on!” you’re doubtless saying to yourself. “What does a chap from Aurora and Unionville and Toronto have to do with the history of the Queensborough area?” Well, I’ll tell you – and if you’re from the Queensborough-Hazzards Corners-Madoc area yourself, you might have already guessed, thanks to Keith’s last name. For about as long as there has been settlement in our area, you see, there has been the name Kincaid. 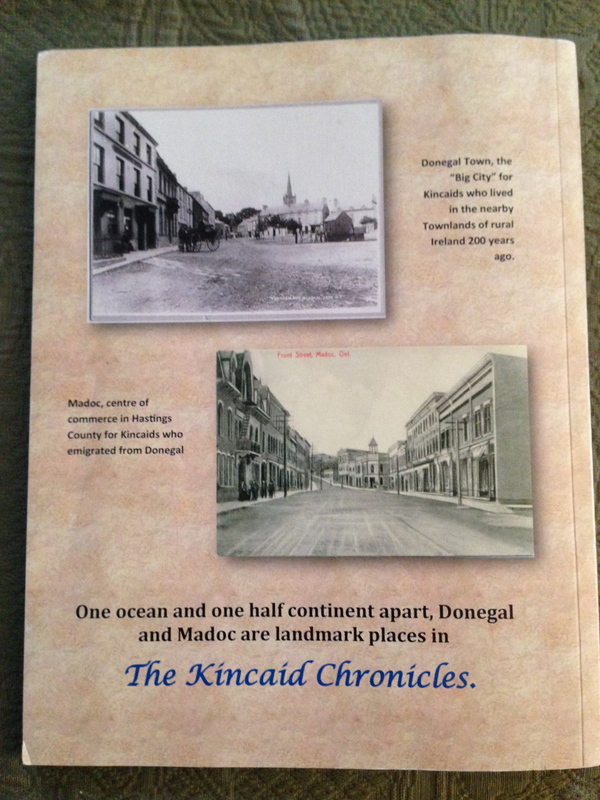 That is because one Patrick Kincaid, Keith’s great-great grandfather, chose back in 1843 to leave a hardscrabble existence in Donegal, Ireland (his own ancestors having moved there from their native Scotland) and settled first in Hungerford Township (south of what is now the village of Tweed) and then permanently near Hazzards Corners, in Madoc Township. Which is just down the road from Queensborough. In putting together the story of his family in a book called The Kincaid Chronicles: Beyond the Back Fence, Keith has used his training and experience as a journalist – the culmination of his impressive career in that field was his long service as president of The Canadian Press – to dig up the full story. And what a story! Why, there’s even a murder mystery! But I’ll get to that in a minute. The short version of the story is that Patrick Kincaid, a widower with eight children, arrived in Hungerford Township in 1843 by way of the Atlantic Ocean, Quebec City, the St. Lawrence River, Lake Ontario and Belleville. He sold his Hungerford Township farm in 1850 and bought land in Madoc Township, at a well-known sharp bend in what is now Queensborough Road, the road west of our hamlet that runs to Hazzards Corners. The brick farmhouse that the family eventually built still stands and is still lived in; when I was a kid growing up in the Manse here in Queensborough, it was the home of farmers Gordon and Earl Sager. “The Sager Brothers,” my dad always used to call them. Good people. 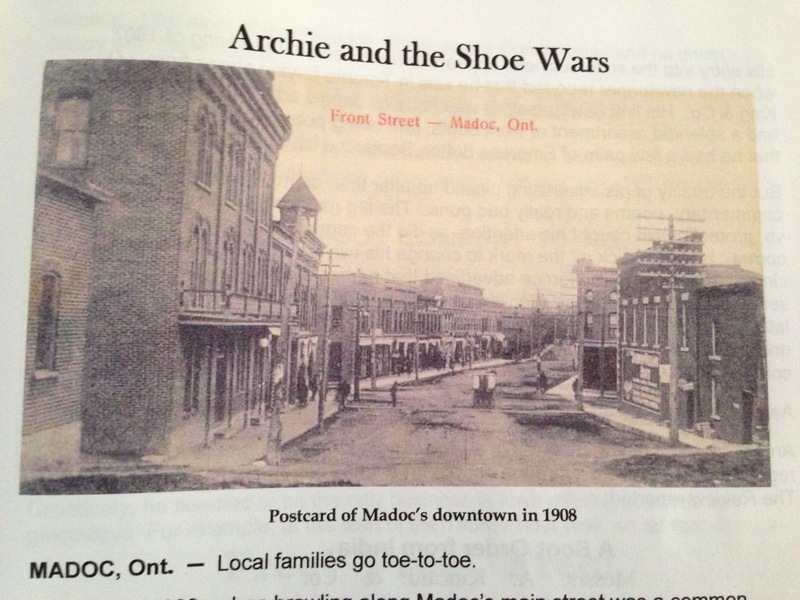 Archie and the Shoe Wars, just one of the may colourful chapters in Keith Kincaid’s book. It sheds a wonderful (and often humorous) light on early life and times – including retailing times – in the village of Madoc. Oh yes, and there’s that murder mystery I mentioned. 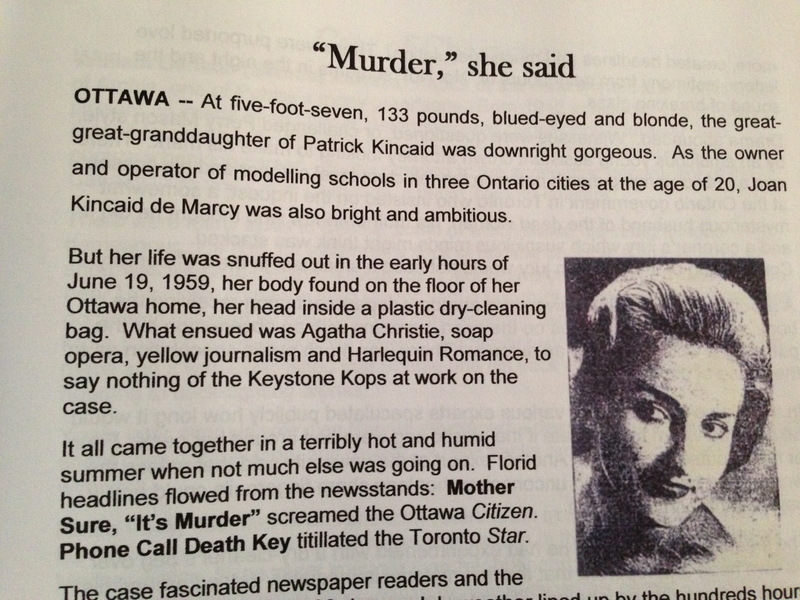 It was quite the cause célèbre in Ottawa, back in the summer of 1959, when Joan Kincaid de Marcy, a beautiful young wife, model and owner of modelling agencies, was found dead in her home. Her husband, a dashing Frenchman, was something of a suspect, but there were other intriguing characters in her complicated story too. (Not to mention some dubious police work.) Eventually Joan’s death was found to be accidental, but as Keith’s excellent retelling notes, not everyone believes that. At any rate, the whole project is a tribute to how much historical treasure can be unearthed (never mind those never-realized mineral riches underneath the old Hastings County farms) by one person’s interest, persistence and hard work at researching, interviewing, sleuthing, and travelling to the scenes of past chapters in the story. 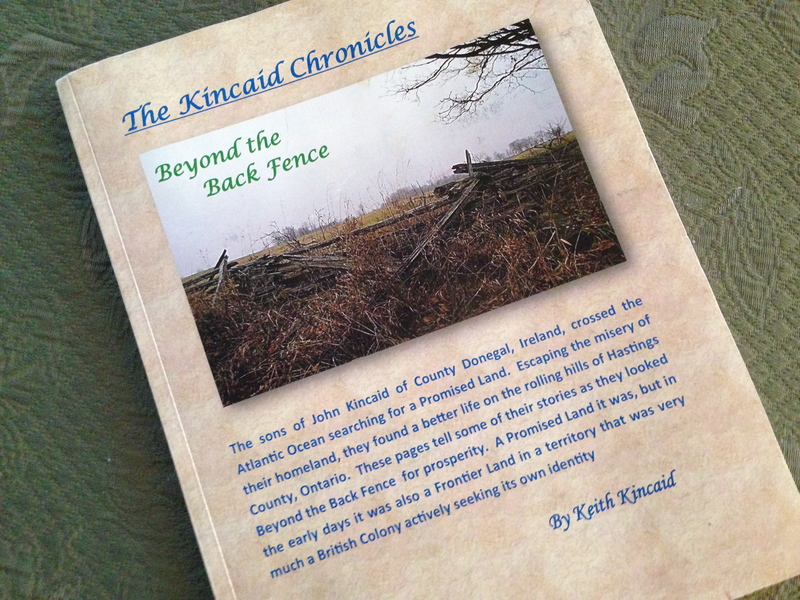 If you’re interested in the history of Kincaid family and/or the history of our part of Hastings County, I highly recommend The Kincaid Chronicles to you!